Germany, Tel. : ++49 2234 957 10. Radiometric line detectors have succeeded for baggage control and computed tomography (CT). This principle seems to be suitable for other applications too. A radiometric CCD-line camera was designed and proposed for weld inspection as early as 1986 . The optimal application field of this unit was the inspection of thin metal plates. New developments on the field of x-ray line cameras for CT-applications are suitable for automated scanning of welds [2,3]. 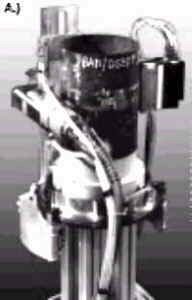 A modified radiometric line camera of BIR  was assembled together with an adapted ultrasound-manipulator and a mobile 225 keV x-ray tube (fig. 1) for in-field inspection of welded pipelines. The developed device (fig. 1) permits to scan circumferential welds with a scan width of about 100 mm. The pixel resolution amounts to 50 µm for 2048 pixels per line. Corresponding to fig. 1 the camera and the x-ray tube are separated on the pipe by an angle of 180o. They are moved line by line around the circumfer-ence to acquire the radiometric image. Fig 1: View of a) the complete line scanner and b) of the working principle of the unit. The applied principle of line scanning yields several advantages in comparison to film radiography. The radiation direction corresponds to the central projection technique which always enables radial penetration. All radial flaws are detected with maximum contrast. The special slit collimator of the camera reduces the intensity of the scattered radiation significantly. The properly aligned system (fig. 3) yields therefore better image quality than film radiography for pipes with thick walls and especially for water filled pipes. The developed system provides radiometric images with high image quality for a penetrated steel thickness of 4 - 46 mm (2 - 23 mm wall thickness) in a comparable time to manual radiography. Due to the limited resolution of the applied camera of about 160 µm (measured with double wire IQI by EN 462-5) theoptimum application range covers wall thicknesses of 10-25 mm from the present point of view. The testing of higher wall thicknesses is also possible but requires modification of the line camera. The description of the line camera design is outlined in [2-4]. After a few modifications the camera could be operated near the physical sensitivity limit. The spectra of different x-ray tubes and g-sources were calculated to simulate the detector properties and the expected sensitivities as a function of the wall thickness of steel and the measurement time [4, 5]. Only x-ray tubes enable the application of the line scan technique in a reasonable time which is comparable with the manual radiography technique and its image quality. The line camera yields a sensitivity of about 90% (~ 81% DQE) of the calculated physical limit up to about 35 mm penetrated steel thickness at 225 keV. The high scatter ratio of water filled pipes reduces the image contrast considerably. Therefore film radiography is performed for empty pipes usually. The absorption of water cannot be reduced. But in comparison to film radiography the scatter ratio k can be diminished by the collimation technique to about zero. This collimation improves the specific contrast csp for water (or other media) filled pipes as well as for thick walled pipes, where csp = /(1+k). Fig 2: Comparison of a digitized radiograph (left image) and a line camera image (right image) of a water filled pipe weld. Fig. 2 shows the comparison of a radiograph taken from a water filled steel pipe (diameter 160 mm and wall thickness 12 mm) and the image made with the line camera. For better comparison the radiograph was digitized and printed under comparable conditions. The radiograph is characterized by the typical effect of changing optical density from the edges (left and right) to the centre. The contrast is relatively low and the scanned image is easier to interpret due to the typical magnification. The contrast gain of the scanned image can be visually recognized. One of the major tasks of the in-service inspection of circumferential welded pipes of steel (also austenite) is to distinguish between undercut and crack corrosion. The depth information of the radiometric indications can be an essential tool for this evaluation. The basic problem of radiography as well as of the radiometric scan technique is the dependence of the measured crack contrast on the radiation direction in relation to the crack location. Only parallel transmission to the crack plane (or to the greatest planar area) provides sufficient contrast. This requires application of the multi-angle technique. The available scanner enables modification of the radiation direction. It is possible to set up the system for a special inspection of side wall flaws. Scanning the weld under different angles provides multi-angle projections which improve the probability of detection for flat inhomogeneities in the material like cracks and lack of fusion. The principle of the application is based on the multi-angle technique. The x-ray tube is shifted in the direction to the pipe axis step by step. For each step a full 360o scan is taken. In contrast to the x-ray tube the line camera is not shifted. This algorithm corresponds to the coplanar translational laminography  transformed to the inspection of a pipe. If the x-ray tube is shifted parallel to the pipe axis and in addition, each step is combined with an angular shift, the principle of coplanar rotational laminography can be applied . Due to this analogy between the configuration of multi-angle technique and laminography, the three-dimensional (3D) reconstruction of the weld is possible. Then, either all measured radiometric scans can be measured or (and) the weld can be inspected plane by plane from the reconstructed 3D-data set [fig. 3]. The tomosynthesis was performed on the basis of different linear and non-linear backprojection estimates [6-8]. In this case all estimates give similar results. However, estimates with regulated additive accumulation of beamsums are slightly better than strictly multiplicative procedures, such as the minimum projection method. The tomosynthesis which can usually be performed from a few projections only (for crack detection) needs a higher SNR and contrast per projection than the classical computed tomography. SNR improvement was achieved using non-linear averaging (e.g. median) and contrast enhancement by an additional threshold operation of the filtered projections corresponding to the maximum and minimum of the histogram analysis of all relevant projections in a preselected region of interest. Fig 4: Profiles of a welded wall of an austenitic pipe after stress crack corrosion, The crack (black) is located near the weld (light area). A and B are reconstructed profiles at different positions. Fig. 4 shows the reconstruction of a crack which was found in the weldment of a separated austenitic pipe of a nuclear power station. This pipe had a diameter of 160 mm and a nominal wall thickness of 8.8 mm. The reconstruction was performed with the average method [4, 6-8]. For high accuracy applications the principle of planar tomography is applied. The X-ray source is shifted corresponding to fig. 5 parallel to the pipe axis only and the camera is located opposite to the X-ray tube below the weld to inspect. During the movement of the X-ray tube 200 - 400 projections are acquired in a radiation angle range of ± 20°. The camera is not shifted for each set of projections. In principle a higher angle range is preferable. The ± 20° were selected due to practical restrictions. Planar tomography provides undistorted reconstruction results for cracks and lack of fusion if the defect plane is oriented inside the inspection angle range. Artefacts arise for volumetric indications only due to the missing projection angle problem. The used reconstruction is based on a modified filtered back projection. This algorithm is a typical analysis method and is applied for cross-sectional analysis of preselected regions of interest. The measurement time for one set of projections amounts to 3 - 6 minutes per cross-section depending on the wall thickness (8 - 20 mm). The reconstruction time is about one minute on a PC. Fig. 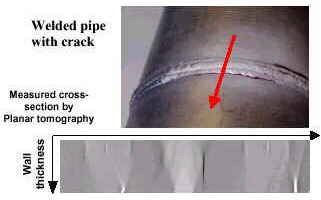 6 shows a typical indication of a crack in an austenitic pipe weld. We thank Dr. V.A. Baranov and Dr. A. Likhachov for interesting and helpful discussions and for software support. We also thank Mr. Diener of ALSTHOM Energie for the manipulation technology and the Mr. Trobitz and Walkmann.of the nuclear power station Gundremmingen for support. R. Link, W. Nuding, K. Sauerwein, H. Wiacker: "Radioscan D25, ein bildgebendes System hoher Auflösung in der Durchstrahlungsprüfung", Jahrestagung der DGZfP, Münster, 5.-7. Mai 1986, Berichtsband. R. T . Bernadi: "Steel weld inspection with digital radiographic line scanning", ASNT 1993 Spring Conference, 29.3.-2.4.93, Nashville, TN, USA, p.78-80. C. R. Smith. J. W. Erker: "Low cost, high resolution X-ray detector system for digital radiography and computer tomography", SPIE's 1993 International Symposium on Optics, Imaging and Instrumentation, 11.7.-16.7.93, San Diego, CA, USA. B. Redmer, Y. Onel, U. Ewert, H. Diener, J. Müller: `Automatisierte Schweißnahtprüfung auf der Basis eines ZeilenscannersA, Jahrestagung der DGZfP, Dresden, 5.-7. Mai, 1997, S. 769-776. H.-P. Weise, P. Jost, W. Freundt: "Quantum yield, Photon numbers by conference proceedings"; Jahrestagung der DGZfP, Mainz, 24.-26. März 1978, Berichtsband, S.553 ff. U. Ewert, J. Robbel, C. Bellon, A. Schumm, C. Nockemann: "Digital Laminography", Materialforschung, 37 (1995), H.6, S.218-222. B. Redmer. U. Ewert, Y. Onel, V.A. Baranov: "Untersuchung zur Optimierung der Aufnahmeanordnung für die Tomosynthese und strukturabhängige Vorfilterung", Jahrestagung der DGZfP, Lindau, 13.-15. Mai 1996, Berichtsband, S.637-647. V.Baranov, U.Ewert, Industrial application of digital tomosynthesis and special types of non-linear backprojection algorithms, Computer Methods and Inverse Problems in NDT and Diagnostics (CM NDT-95), Minsk, 1995, pp. 82-86.